Chronic pain (CP), such as chronic low-back pain (C-LBP), chronic facial pain (C-FP), or chronic neuropathic pain (C-NP) is highly disabling, leading to dramatic impacts on various aspects of quality of life (QoL). CP can lead to a somatic disperception, i.e. substantial mismatch between the sensation of the affected body part and its actual physical state. Since pain ratings rely on subjective reports, a distorted body image can lead to incorrect pain ratings resulting in incorrect treatments and to the risk of drug abuse. Virtual reality (VR) allows augmented multisensory feedbacks helping patients regain a correct body image. Telemedicine can facilitate the transfer of VR treatments to patients’ homes improving access of care. We aim to use hospital- and home-based (telerehabilitation) VR training in C-LBP, C-FP and C-NP patients to improve QoL (primary outcome), reduce pain, improve cognitive functions, mood and functional abilities and improve caregivers’ QoL and burden. 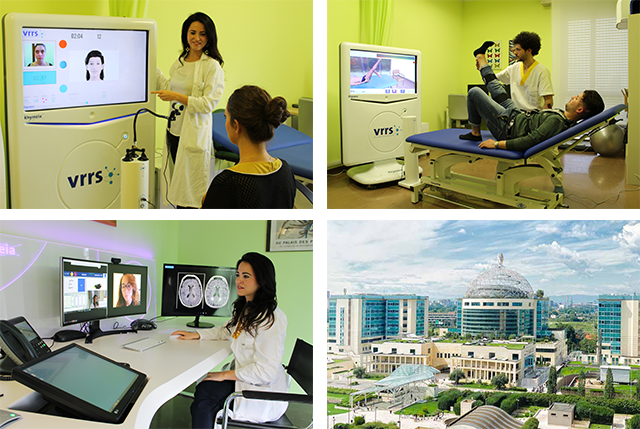 Treatment will consist in a 6-week hospital-based (San Raffaele, Milan) VR training (12 sessions). Then, patients and caregivers will be followed remotely for 6 months. Patients will undergo 2 remote rehabilitative sessions a week, from home, using VR-equipped devices. Caregivers will participate to remote self-help groups once a week guided by a psychologist. Patients’ condition and caregivers’ burden will be evaluated at baseline, after the 6 week-rehabilitation program (POST1), after 6 months of remote treatments (POST2) and 6 months afterwards for follow-up. Patients’ evaluations will consist in neurological exam, neuro-psychological evaluation, pain ratings, sensorimotor functional abilities. A satisfaction and quality questionnaire specifically built by Cittadinanzattiva Onlus in collaboration with chronic pain patients and international patients’ organizations will be filled by each participant in POST2. All treatments and evaluations can be accessible to all nationalities among European countries. The project will be promoted by the Italian Scientific Society ARSOP (Associazione Medici Riabilitatori Specialisti Ospedalità Privata) and Cittadinanzattiva Onlus, who will help raise awareness on chronic pain and on our treatment among patients, patients’ organizations, citizens and rehabilitation specialists.